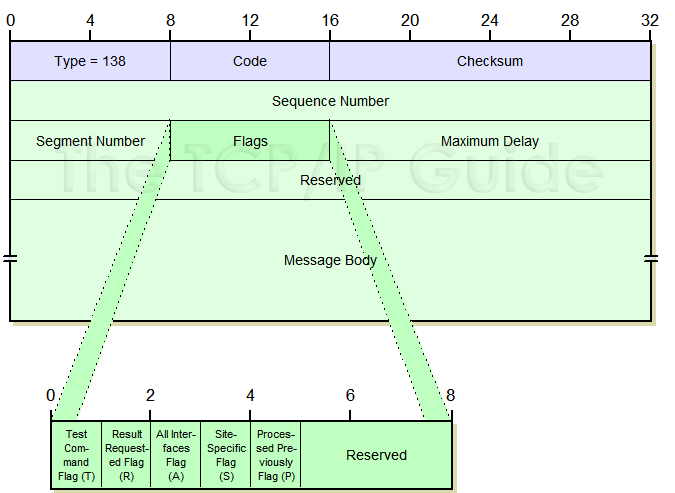 The format of Router Renumbering messages is in Table 114 and Figure 163. 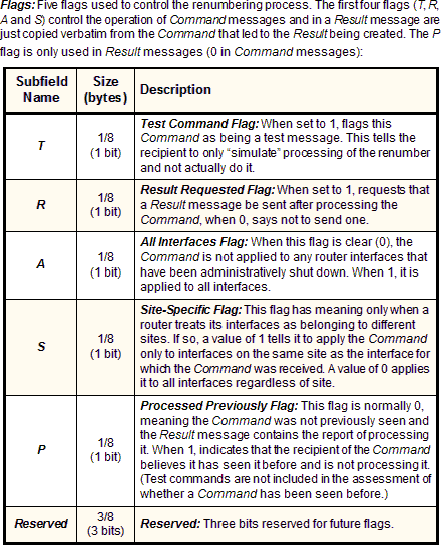 Type: Identifies the ICMPv6 message type; for Router Renumbering messages the value is 138. Sequence Number: A 32-bit sequence number used to guard against replay attacks by allowing a recipient to detect stale, duplicate or out of order commands. Segment Number: Differentiates between valid Router Renumbering messages within the same Sequence Number. Maximum Delay: Tells a router receiving a message the maximum amount of time (in milliseconds) it is allowed to delay before sending a reply. Message Body: For a Router Renumbering Command, the message body contains two sets of information. The first is a Match-Prefix Part for the prefix being renumbered. The second is one or more Use-Prefix Parts that describe the new prefix for each match. A router receiving a Command checks its own interface addresses and if they match the Match-Prefix-Part, they use Use-Prefix Parts data to accomplish the renumbering. For a Router Renumbering Result, the message body contains zero or more Match Results entries that describe each prefix that a router matched from a Router Renumbering Command. Each entry provides information regarding whether renumbering was successful or not for a prefix. Since these messages are intended for all routers on a site, they are normally sent to the all routers multicast address, using either link-local or site-local scope. They may also be sent to local unicast addresses.